Eastern Wrothgar is the eastern region of Wrothgar. Its high mountains result in a frigid, snowy climate. The city of Orsinium and the nearby Shatul Range can be found nestled in the foothills, while Fharun Stronghold is located far to the north. The entrances to Rkindaleft and the Maelstrom Arena are both found at the eastern extreme of this region. To the south, Merchant's Gate links the zone to Bangkorai. 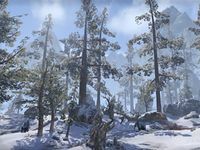 Like the other two subzones of Wrothgar, Eastern Wrothgar is distinguishable by its climate and little else. It has no associated questline or achievements, and has been left purposefully unnamed in-game. This page was last modified on 12 May 2018, at 23:44.